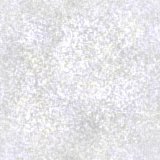 This page is about the LANCHBURY people in Margaret SCANDRETT's Family Tree. 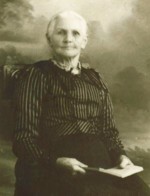 Margaret's mother-in-law, Muriel Gladys LLOYD, was brought up by Richard Frederick LANCHBURY (known as Fred). She was never officially adopted by Fred and his wife Dorothy (nee BATCHELOR), but noted Fred as her father on her marriage certificate. Because of these ties, Margaret has inherited information and photographs of this LANCHBURY family, and I gratefully thank her for sharing them with me. 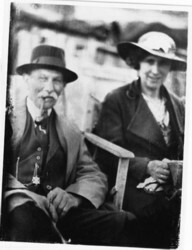 This is Fred LANCHBURY with his wife Dorothy nee BATCHELOR. 'Fred' was Richard Frederick LANCHBURY, 20th Sep 1885, Dumbleton, Gloucestershire, to 26th Jan 1965, Leamington Spa, Warwickshire, England. Margaret tells me "Fred worked on the land mostly as a Waggoner. He was in charge of all horses and the carts, carriages, pony traps and farm waggons belonging to the estate or farm. My husband used to help with the shire horses at harvest time and always travelled to the market town with his 'grandfather' to pick up supplies. After their early days in Gloucestershire the family moved to Wootten Wawaen in Warwickshire and then to Guy's Cliffe Farm at Warwick. When I first met him in 1955 he was the miller at Guys Cliffe Mill just outside Warwick. This was owned by the Earl of Warwick and the Dower House of Warwick Castle was next to the Mill. I think that Fred's wife worked in the Dower house as a Lady's maid for a time. Guys Cliffe Mill was sold c1956 and then Fred and Dorothy went to live in Leamington Spa. 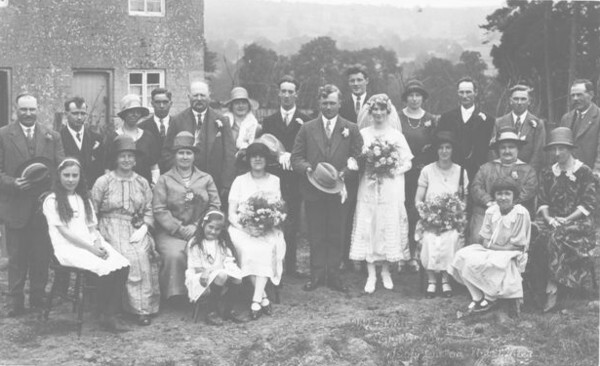 The back of this photo is noted with "Fred's nieces's wedding. His brother Jack's daughter." 'Jack' was probably his brother John, as this was a very common nickname for the name John in this era. I can not do better than print here what Margaret had to say about this photograph. I was totally amazed at her insight and wisdom. "As regards the wedding photo, you can see that a lot of the men have white foreheads. This means they usually wear caps to work so they must be agricultural workers. I guess the time of year is June/July time, as there are beansticks behind the group in the garden but no signs of the beans growing up them yet. The group could be posed with the Grooms family on the left side and the Brides on the right. The lady third from left favours the groom in looks and the two large men are definitely related. The man on the back row in a black suit could be the Brides father; he looks like the Lanchburys." I have since had contact with one of this couple's descendants who have confirmed that it is indeed Emily Elizabeth LANCHBURY and Frank Alfred MACE. 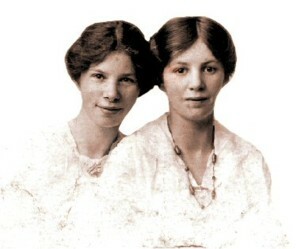 They were married in Winchcombe, Gloucestershire, on 10th July, 1926. Susan Pollard, a granddaughter of Emily and Frank, made contact with me on 28th Oct, 2005 and has very kindly shared information from one of her aunts who gives the following very valuable information. The Man standing immediately to the Groom's right is Tom Kendall. Thank you very much Susan - and to your Aunt too. children that I know of. Her husband was Robert LANCHBURY. both married men named Frank MACE. me on the address below. I have researchers keen to learn more. Please send me an email if you have any further information to add to this page.